Hilda Joyce Barton, age 90, passed away peacefully with her family by her side on August 13, 2018 at the Glens Falls Hospital. Hilda was the daughter of the late Berlin and Hazel (Hitchcock) Bowman. She was born on July 23, 1928, in Bakers Mills, NY. In addition to her parents, Hilda was predeceased by her first husband, Zeno Russell; her second husband, Richard Wells; and her son, Carl Russell. 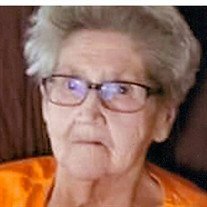 Hilda worked as a waitress and cook in many Schroon Lake area restaurants before her retirement, including Traveler's Restaurant in Pottersville, and Sugar Bowl Restaurant in Schroon Lake. She often shared the story of the day she waited on Lucille "Lucy" Ball when she stopped in for a meal at the Glendale Diner. Lucy was keeping a low profile to avoid her fans and came into the diner in her curlers. Family was first and foremost in Hilda's life, especially her many children and grandchildren. She also had many dear friends she spent time with and, in later years, loved to play a game of Bingo on Thursdays at the Schroon Lake Senior Citizen's Club. Hilda is survived by her husband and sweetheart of over 40 years, David Barton; her children, Phil (Kathy) Russell of Queensbury, Mike "Zeke" Wells of Gilboa, Hazel Wells of Schroon Lake, and Bonnie Wells of Schroon Lake; her grandchildren, Corrina (Al) Maiello of Averill Park, Carlie Russell and her significant other, Randy Vanderwalker, of Schroon Lake, Justin (Cherie) Russell of Gansevoort, and Carl "Butchy" (Amber) Russell of Pembina, ND, and Mickey Ritson of Culver City, CA; her great-grandchildren, Jordan and Nicholas Budwich, Joelle Barrows, Austin and Alyssa Maiello, Ashton and Abby Russell, and Ella and Connor Russell; her daughter-in-law, MaryJo Russell of North Hudson; several cousins; and her furry grandbabies, Lil Bit, Todie and Ruthie. At Hilda's request, there will be no calling hours. Private services will be held at the convenience of the family. Friends may share a memory at online at edwardlkellyfuneralhome.com. In lieu of flowers, donations in Hilda's name may be made to a charity of one's choice. Funeral arrangements are under the direction of the Edward L. Kelly Funeral Home, PO Box 548, Schroon Lake, NY 12870.